Cambodia's famed Angkor Wat ancient Hindu temple complex stands in Siem Reap province, some 230 kilometers (143 miles) northwest Phnom Penh, Cambodia, June 28, 2012. Angkor Wat has triumphed across the centuries to emerge at the world's top tourism landmark in TripAdvisor's Traveler's Choice awards—for the second time since 2015. “This is the Khmer nation's pride, because Angkor is not only part of the prosperous heritage of Cambodia, but it has also become the heart and soul of the nation,” according to Long Kosal, a spokesman for the government's Authority for the Protection and Management of Angkor and the Region of Siem Reap (APSARA). 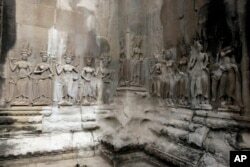 In this July 19, 2012 photo, Apsara sculptures are carved on a wall of the Angkor Wat temple complex in Siem Reap, northwest of Phnom Penh, Cambodia. 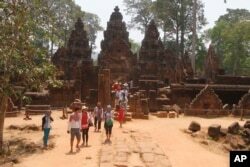 In this April 15, 2016, photo, tourist visit the Banteay Srey temple of the Angkor complex. The Angkor Wat temple is now off-limits to cars as authorities seek to ease traffic jams at the site that draws millions of tourists a year. This file photo from Nov. 15, 2006, shows San Francisco's Golden Gate Bridge, which finished No. 11 in TripAdvisor's Traveler's Choice listings. Until November 2015, the complex was leased to a company owned by Sok Kong, a petroleum magnate close to the ruling Cambodian People's Party. Since then, it has been under government control. The 2017 TripAdvisor awards honored 706 landmarks in 82 countries, with the Sheikh Zayed mosque in Abu Dhabi, United Arab Emirates, the Mezquita Cathedral de Cordoba in Cordoba, Spain, St. Peter's Basilica at the Vatican, and the Taj Mahal in India occupying the next four positions. 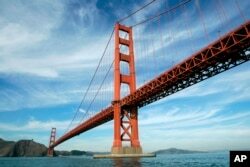 The 80-year-old Golden Gate Bridge in San Francisco holds 11th place worldwide and is the top-rated U.S. landmark.